On May 9th, for the first time ever, the carbon dioxide counter on the side of Mauna Loa, the most important scientific instrument on earth, recorded a daily average of above 400 parts per million. It’s a grim landmark -- it’s been several million years since CO2 reached these levels in the atmosphere. 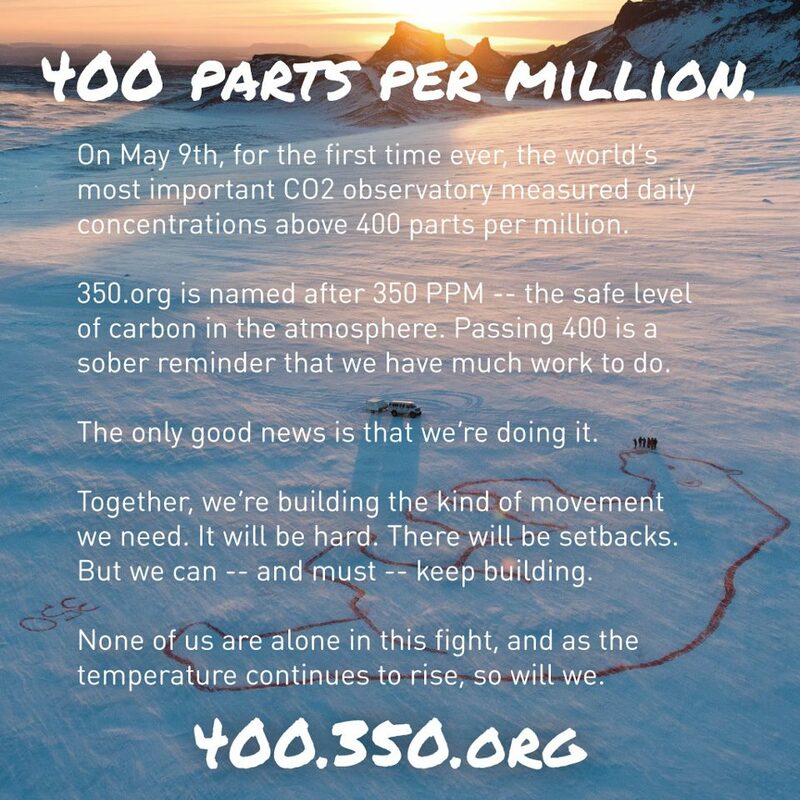 We started 350.org five years ago, and took our name from what scientists identified as the safe upper limit of carbon dioxide in the atmosphere: 350 parts per million. When we started, carbon dioxide levels were around 390 parts per million -- and we knew that to get back to 350 we needed to build a movement to stand up to the fossil fuel money that had stymied all progress. Together we’ve built that movement, and it’s beginning to pay off -- just an hour after the news from Mauna Loa, we got word that the trustees of a fifth U.S. college had voted to divest their fossil fuel stocks, hard on the heels of 11 cities who’d done likewise the week before. But there’s no happy-talking the fact that for now we’re losing: the carbon in the air keeps rising, and with it the temperature, and the devastation. We’ve got to build the movement bigger yet. In a few days we’ll launch the next phase of mass action in the United States, coming on the heels of the largest climate rally in US history this February. Next month in Istanbul we’ll convene Global Power Shift, an ambitious organizing project bringing together 500 young activists from 135 countries in order to spark a global wave of action to put pressure on our leaders from all sides. Your help, is (as always) needed. Many are already giving much time and energy, but if you could pitch in funds as well, that would be a huge help as we plan for the next 6 months or so. If you have the resources to become a sustaining donor, who sends us a repeating small sum every month, it would make it easier to plan for the months ahead. We’ll pinch every last penny out of it—many of us are volunteers, and we keep our staff small as to put as much into the movement as possible. Thanks as always for being part of this fight. And if you’ve been waiting for the critical moment to toss yourself into this battle, well, the news from Mauna Loa is as good as signal as you’re going to get about how much this planet and all its people need you.